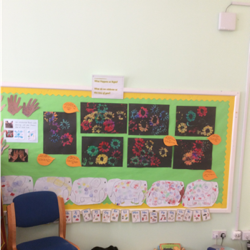 Please follow the link below to the Book Trust, as discussed in Sunflower Class Parent Workshop. 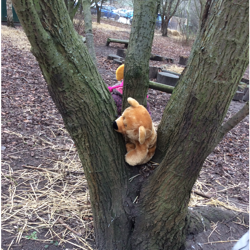 Look at these lovely photos we took in the woods when we were looking for signs of Spring. 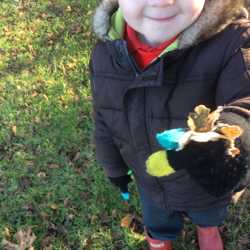 We have been learning about tadpoles and frogs. 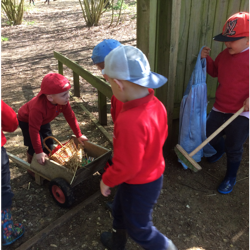 In week 1 we started learning about minibeasts and dug the garden ready for planting. 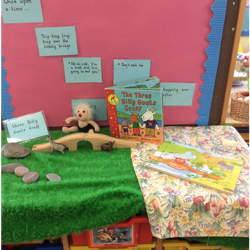 In our first week back we completed our Traditional Tales Topic with the story of the Three Little Pigs. 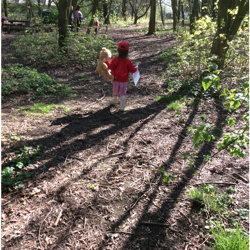 We had a hunt in the woods for props from the different stories that had got lost. 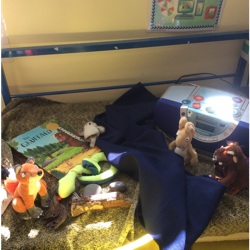 We thought the troll was a bit like a Gruffalo, so we put the Grufallow story in our listening station. We made our own pictures of the Gingerbread Man. 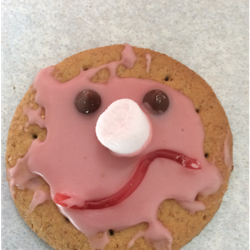 We are making Gingerbread Men on Fridays when we cook, so everyone gets a turn to make one. They are delicious! 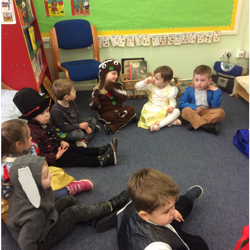 We are learning some traditional Tales this term, starting with the Three Little Pigs. 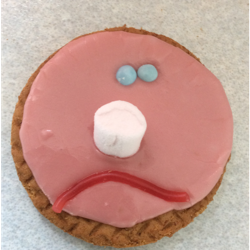 We made pictures of their houses and iced biscuits to make happy or sad pigs, depending on whether their houses have blown down. We used props to re-tell the story ourselves. We are learning about ways to start and finish a story and whether or not it has a happy ending. We have learned a new song to tell the story too. We enjoyed celebrating Chinese new year. We practised writing in a Chinese style using special brushes, just like the one in "The Magic Paintbrush," a story about Shen and the Emperor. We also learned about the Chinese New year story. We learned how to say "Hello" and "Happy New Year" in Mandarin and how to eat prawn crackers with chopsticks. We enjoyed dancing to Chinese Music and making kites. 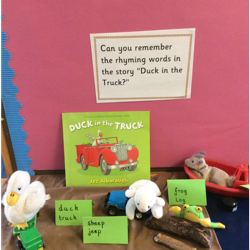 We have been enjoying all the stories in the Duck in the Truck series by Jez Alborough and developing our book talk by comparing the storylines and talking about the characters. We've been practising spotting the rhymes in the stories. 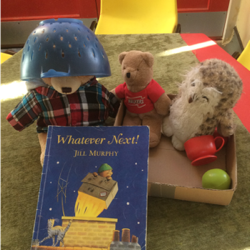 We have finished the term with Jez Alborough's Teddy stories. We loved the way the friendship between the bear and Eddy developed over the three books. We watched a video of Jez Alborough reading the story himself (Google Jez Alborough reads Where's My Teddy if you'd like to watch it at home). 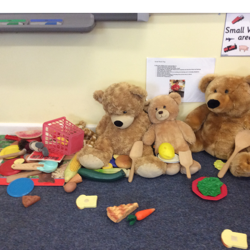 We enjoyed re-telling the story with props and made our own bears' picnics. 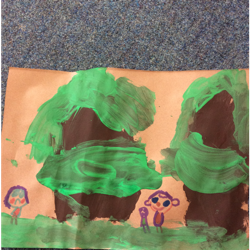 We all painted a picture of the woods - these are displayed in nursery. 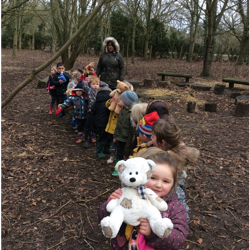 We played Mr. Bear in PE and a 'Where's My Teddy?' game in the woods. 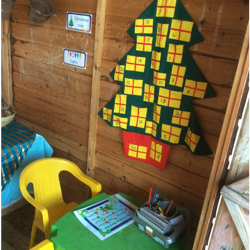 In our first week back we were thinking about the cold weather we had in the holidays. We played with ice and made snowy pictures. A: It's a whale. It might come out and melt. We enjoyed the story "Harry and the Robots" and made some robot models of our own. What a lovely morning for the woods! We are thinking about the changing seasons this term. 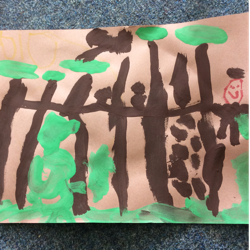 We collected leaves in the woods and then painted our own to decorate our play shed. 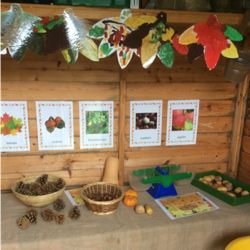 We have conkers, fir cones and autumn vegetables to play with. We've been making some lovely soup in the cauldron! One of our learning questions this term is about what happens at night. 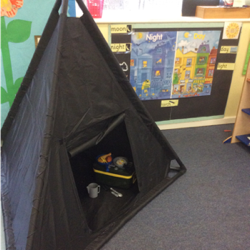 We explored light and dark with the torches in our dark den. We are learning about different celebrations that take place at this time of year. 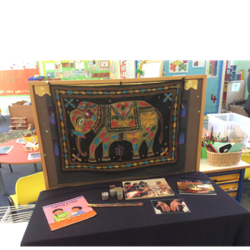 We danced for Divali and had a special snack time with naan bread and chutney. 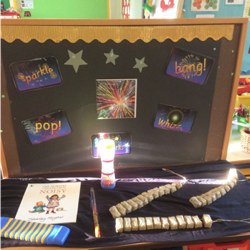 We have been talking about fireworks, developing our vocabulary as we share our experiences. 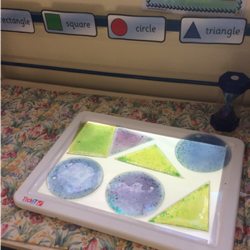 In the second week of term we had lots of activities exploring shape. 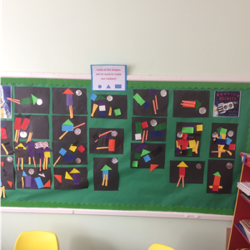 We used shapes to make these rocket pictures for our wall. Here is a list of books we will be enjoying this term. They are all linked to the theme of night time or bedtime. As the nights draw in, we find these are things that particularly interest the children. 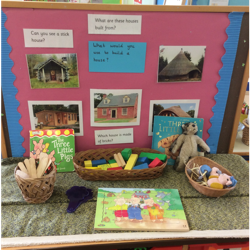 As well as story times, the children will have a variety of opportunities to talk about, listen to and explore these stories and themes. 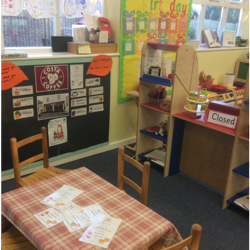 We enjoyed reading "The Tiger Who Came to Tea" and have a role play cafe like the one in the story. We are developing our literacy skills by choosing from the menu and specials board and taking orders. As the weather has been cold we had some ice to play with.
" “ It’s melting... It’s turning into water... My ice is disappearing." 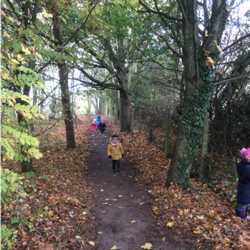 When we went to the woods we looked at the frost and made links with our experience with the ice. We have looked at ourselves and drawn portraits. 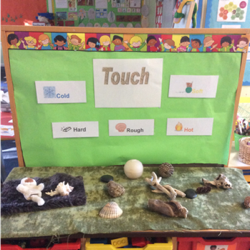 We have been learning about touch. 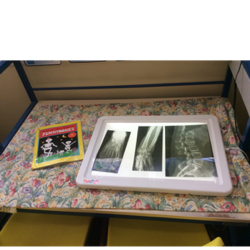 We made textured collages and explored the different objects on our feely table. We played with a game with a feely bag at circle time, developing our vocabulary. Follow up at home: Why not put together a feely bag or make some collage pictures at home? We are enjoying the different instruments in our sound shack and sing them to accompany ourselves as we sing nursery rhymes. 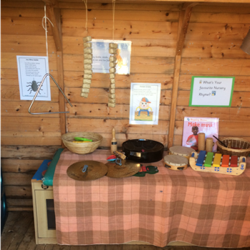 Use everyday objects like saucepans and spoons as percussion instruments and sing some nursery rhymes together. 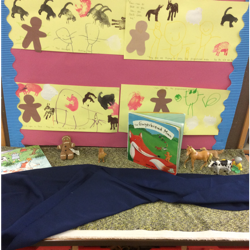 We have been reading stories about growing, such as "Titch" and "You'll Soon Grow Into Them Titch." We measured ourselves on the height chart and made handprints to see how high we could reach. We wore our favourite clothes and showed our friends what we were wearing. We also sorted toys by size, using size language to describe and compare. Supporting this learning at home: Compare the different members of your family. Who is the smallest? Who is the tallest? Sort everyday items by size, such as spoons or clothes. Practise indpendent dressing. The children are learning the "hood trick" for putting on their coats. If you put it on by the hood first, it's easier to get your arms in the sleeves by yourself! 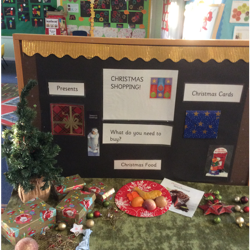 In our last week of term we are learning a bit about fruit and vegetables. We have vegetables and compost to play with and a vegetable shop with some real turnips, squash and pumpkins. On our interest table there are herbs from the garden to touch and smell. We will be examining some sunflower seedheads that have last year's class planted. We will be reading Handa's Surprise and The Enormous Turnip and we will make fruit salad for snack on Friday. On Thursday we will go to the school woods for the first time!